FROM the foregoing narrative we may infer that Bede did not travel far from the monastery. This is both plainly asserted in his own account of his secluded life, and appears also from the want of any evidence to the contrary. Yet it is certain that he made visits and excursions to other places, nor can we suppose that he secluded himself entirely within the monastery, and never indulged the pleasure of seeing and conversing with his friends. In his own letter to Egbert, Archbishop of York, and nephew to King Ceolwulph, he alludes to a visit which he paid to that nobleman and prelate, and acknowledges an invitation to go there for the sake of conferring with him on their common pursuits in the year following. He was unable to comply with this request, in consequence of illness, and therefore communicated with his friend by letter. In another letter, still extant, addressed to Wichred on the celebration of Easter, he speaks of the kindness and affability with which he had been received by him on a former occasion. It is not improbable that he might sometimes likewise pay visits to the court; for Ceolwulph, King of the Northumbrians, in one of whose provinces, i.e. 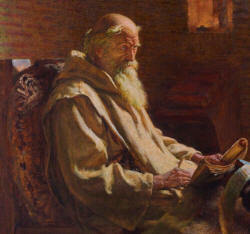 Bernicia, Bede lived, was himself a man of singular learning, and a very great encourager of it in others; and had, doubtlessly, an extraordinary respect for Bede, as appears by his request to him to write the Ecclesiastical History, and by Bede’s submitting the papers to him for his perusal. That prince was not only a lover of learned men in general, but especially of that part of them who led a monastic life, insomuch that, about three years after Bede’s death, he resigned his crown, and became a monk at Lindisfarne.